1) If you’re still looking for that last-minute Halloween costume, you might consider picking one that incorporates a cigar. 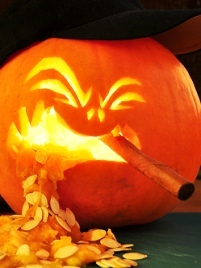 For ideas, check out our list of the top 20 cigar-friendly costumes. And, no, we can’t recommend a cigar pairing for Snickers. 2) California is home to some of the most anti-tobacco municipalities in the U.S. In 1990, San Luis Obispo became the first city in the world to criminalize indoor smoking in all “public” places. More recently, politicians in Calabasas made outdoor smoking illegal. Now the Golden State’s largest city, Los Angeles, is tightening the screws. Officials there are moving to ban smoking in and around outdoor dining areas, such as restaurant patios, kiosks, and mobile food trucks. 4) Around the Blogs: Stogie Review lights up a Room 101 by Camacho. Smoking Stogie really enjoys the Cohiba Gran Reserva. Cigar Reviews fires up a Montecristo No. 4. Keepers of the Flame reviews the Padrón 1964. Nice Tight Ash torches a My Father Cedros Deluxe. 5) Deal of the Week: Here’s another special unannounced sale over at Cuban Crafters, which includes price cuts you won’t find from their regular homepage. Deals include a humidor box of Cubano Claros ($89), a box of 25 Cuban Crafters Cabinet Selections ($74), a bundle of Don Kiki Greens ($34), and a box of La Carolina Torpedos ($75). Grab yours here.